Dr. David Aversa and CT Psychiatric & Wellness Center are proud to offer NeuroStar Transcranial Magnetic Stimulation (TMS) Therapy in New Haven County. 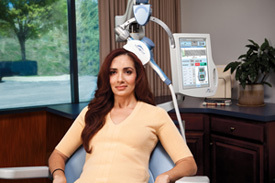 TMS is an innovative treatment for depression that is non-invasive and drug-free. TMS therapy is intended for adults with Major Depressive Disorder who have failed to achieve satisfactory results from prior antidepressive medication. Our staff will work with you to ensure that you are receiving optimal treatment and care. To set up a consultation, please call Betty at 203-550-3719. Transcranial Magnetic Stimulation Therapy: Dr. Aversa Talks TMS on WTNH's Connecticut Style! Check out TMS featured on The Dr. Oz Show!